Braving the malls on Black Friday? These are great spots to take a break in downtown Seattle and downtown Bellevue. For those who avoid the lazy lure of Amazon to brave the cold on Black Friday, we offer you drink recommendations. Don’t want to deal with the mayhem at the chain restaurants? Hit the third floor of Pacific Place, to the Sixth Avenue Wine Seller and its hidden 30-seat back bar. For something festive, walk to Oliver’s Lounge inside the Mayflower Park Hotel for a dry martini and window views of the 12-story Christmas tree across the street. But the best-kept secret of a hotel bar, The Polar Bar, is located inside the Arctic Club Hotel on the second-floor lobby. It’s an homage to the old gentlemen’s club. RN74 is popular for its great wine selection and bar food. 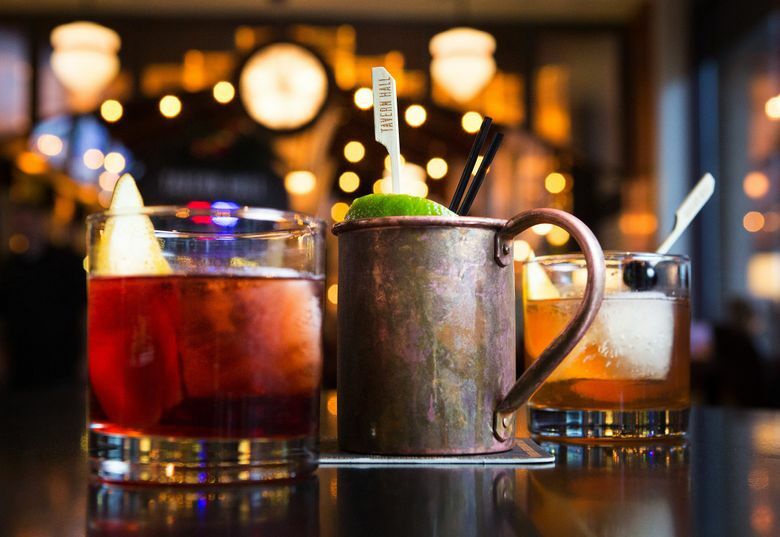 And just in time for the holidays, it recently launched a new happy hour (4-6 p.m.). For something cheaper and more of a homey vibe, hitThe Diller Room, where stiff cocktails cost a couple bucks less than the other downtown haunts. A great hideaway, Bernard’s on Seneca is old-school Seattle. Look for the oak door that leads to this medieval-like subterranean space with a Bayeux-esque tapestry. Also, a couple of Black Friday specials: The popular Capitol Hill beer hall Rhein Haus will feature black beer, and we don’t mean the dye kind, while Rob Roy in Belltown will host a pop-up with holiday-themed drinks for charity. Lincoln Square should be the “it” scene since it’s the hub of most of the big-name openings on the Eastside fromBaron’s Xi’an Kitchen and Barto Japonessa. All the pretty people, though, will likely be hanging out at the new, sleek Living Room Bar in the W Hotel. For something festive and kid-friendly, hit the new Sugar Factory bar restaurant at the Shops at The Bravern. Doors will open early: 11 a.m. (You know you can’t just leave your kids in this candy nirvana to go shopping, right?) Nordstrom has a cocktail bar, The Habitant, to wait it out while your significant other shops. An old reliable option is Tavern Hall at Bellevue Square. It boasts 30 flat screens spread across two bars, each with 20 craft beers on tap. The lounge area includes leather couches, a fireplace, shuffleboard and darts. But more importantly, Tavern Hall serves one of the best burgers in downtown Bellevue.